Explosive and unforgiving, Confessions of an English Opium-Eater describes in searing detail the pleasure, pain and mind-expanding powers of opium. Part of the Macmillan Collector’s Library, a series of stunning, clothbound, pocket-sized classics with gold-foiled edges and ribbon markers. These beautiful books make perfect gifts or a treat for any book lover. This edition is introduced by biographer, critic and academic Dr Frances Wilson. Thomas De Quincey takes us on a journey from his grammar school childhood to his homeless adolescence in Wales, from befriending prostitutes during his nocturnal wanderings in London to enrolling at Oxford University only to drop out when his drug use overcomes him. Thrust into a disorientating world of extreme euphoria and vivid nightmares, De Quincey’s life story is both unpredictable and deeply personal. 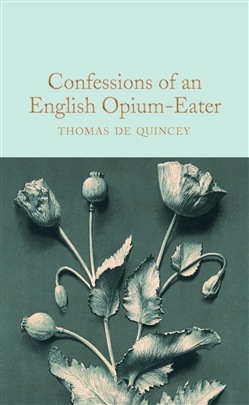 Confessions of an English Opium-Eater is considered to be the first published autobiography to explore the lure and effects of addiction. Acquista Confessions of an English Opium-Eater in Epub: dopo aver letto l’ebook Confessions of an English Opium-Eater di Thomas De Quincey ti invitiamo a lasciarci una Recensione qui sotto: sarà utile agli utenti che non abbiano ancora letto questo libro e che vogliano avere delle opinioni altrui. L’opinione su di un libro è molto soggettiva e per questo leggere eventuali recensioni negative non ci dovrà frenare dall’acquisto, anzi dovrà spingerci ad acquistare il libro in fretta per poter dire la nostra ed eventualmente smentire quanto commentato da altri, contribuendo ad arricchire più possibile i commenti e dare sempre più spunti di confronto al pubblico online.